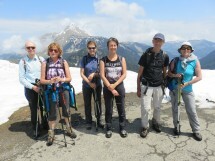 I propose a hike from Lake Montriond (Morzine after), 55 km from Geneva. Climb the Choseau and Barme, a first trail in the forest and in the meadows down Roulainnes and Col de Aup Couti (1812 m). Browsing Ridge Ovens to the Col de Bassachaux (1778 m). Climbing on the Tête des Lindarets (1950 m). And return by the tourist hamlet of the same name. Elevation gain 800 m, 12 km distance. Total length without breaks 6 hours.